The following is the emigration diary of Joseph Gordon (born 1794 - died 1881). Joseph sailed from Dundee, leaving on Thursday 16 September 1841 and arrived in Sydney on the 17 January 1842. He settled in Bathurst. Prior to emigration Joseph Gordon had a Drapers business in Montrose. Joseph was born in Glen Girnoc at Bovaglia and was educated by "three Elizas". As a young man he was employed by the Countess of Airlie, and whilst in her employment wrote "Poetical Trifles by an Obscure Bard in the Braes of Angus" (published 1825). In Australia, Joseph Gordon had "Botany Bay and Other Poems" published in 1861. 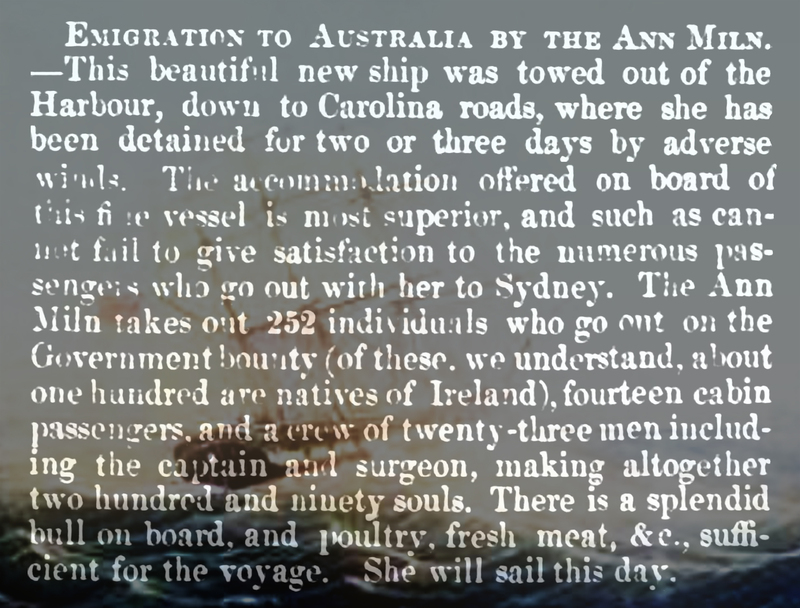 The following diary comes from "The Emigrant Barque with some Traits of Australian Life and Character, in Verse and Prose Joseph Gordon"  which was published in 1871. This diary has been transcribed by Michael Ward who has very kindly given me permission to reproduce it here. Thursday 16 September 1841 — Agreeable to your request, I proceed to make a few jottings of our voyage, so that you may know how we are getting on, should I have an opportunity by way of sending them home. After being, as you are aware, for four days wind bound in the Tay, we were taken in tow this afternoon by the ‘Modern Athens’ steamboat, and are now fairly afloat on the bosom of the blue waters. The Rev. Mr Law distributed a good many Bibles among the emigrants, and thereafter addressed us all in a very impressive and affectionate discourse. Many were in tears, and it is to be hoped that all will carry a salutary impression of what they heard along with them to the land to which they are bound. Though our delay in the Tay was deemed by all tedious and unpleasant, yet it was so far beneficial, as it served to make us more acquainted with each other, thus preparing us to sympathise the more with each other in our little discomforts. A good deal of sickness and some tears onboard, but nothing more than might have been expected. Friday 17 September — Morning thick and hazy, with little or no wind. A good many birds coming off from the land near Montrose, and settling about the rigging of the ship — I presume, with the intention of wishing us all a prosperous voyage, and bidding me, being an old acquaintance and Montrosian, farewell. Monday 20 September — Yesterday being Sabbath, the doctor read prayers on the poop; but owing to sickness prevailing, and a pretty high sea running at the time, few were able to attend. We sang the first four verses of the Ninety-fifth Psalm, and the whole of the Twenty-third, Mr Anderson, from Arbroath, acting as precentor. It is a pleasing and impressive thing to join in the worship of Him to whom the spacious sea belongs, in the midst of that expanse of waters whose every mighty wave seems as if commissioned to speak audibly to the wanderers o’er the deep of its and their Creator’s great and eternal power and majesty. Barney, an Irishman, is very ill with inflammation of the bowels. Poor man! He has a large family; and should he be taken away, it will be a melancholy thing for them. To-day the weather is clearing up, and the “Anne Milne” going at the rate of ten knots an hour. We shall soon leave the Orkneys behind us. The light-house on the Island of Sandy, and a wind-mill further on, visible on our left. A heavy sea rolling in from the Atlantic, to which our good ship is nobly setting her shoulder, and forcing her way through in grand style. Some of the women looking with a longing eye to dry land; but we talk of Sydney and the good things awaiting them there, and cheer them up as we ought. Tuesday 21 September — Beautiful weather and a fine breeze: the first morning we have seen the sun since leaving the Tay. Sea sickness abating, and all beginning to look cheerful and happy, except poor Barney, who is no better. Preparations making among the cabin passengers for getting up a manuscript news-paper, a debating society or club, and dramatic representations, so that we are resolved to fling care and ennui overboard for a time. We are sweeping along the north-west coast of Ireland at the rate of twelve knots an hour, and giving all due praise to the “Anne Milne,” who is treating us handsomely, and promises to do great credit to her builders, and give every satisfaction to all concerned. Wednesday 22 September — Poor Barney, or Bernard Cavenagh, died last night at twelve o’clock, and had his remains committed to the deep this morning at eight. The cabin passengers dressed in black for the occasion; the bell tolled with a slow and solemn sound while they were bringing his remains from below and laying them along the side of the ship. The doctor read the funeral service, and thereafter the seamen, who were also dressed in their best clothes, dropt his remains into the deep from a wooden frame, apparently for such purposes, His body was sewed up in canvas, and an iron weight attached to his feet to make him sink. He has left a wife and three children, who will be taken care of by the Colonial Government on their arrival at Sydney. He had suffered much from fatigue and want of food on his way from Ireland to Dundee, and was very poorly when he came on board. I composed some lines on his death, which were inserted in our manuscript newspaper, and much admired by all who read them, more, no doubt, from the occasion on which they were written than from any merit of their own. Here they are: Lines on the death of Bernard Cavenagh, who died at sea, on board the “Anne Milne” of Dundee, on his way to Sydney, Wednesday 22 September 1841. All he asked from his own, in vain! Which none may lightly scorn. As they left their native shore. And his eyes were closed in death. To prolong life’s fleeting flame. Ere they dropp’d him down below. No trace of the dead is seen. No record’s here to tell! So the soul but repose with its God! We have had a heavy sea and rather rough weather these two days past, with much sickness on board. In a few days we hope to see Madeira, should the wind continue favourable. Saturday 25 September — Entered the Bay of Biscay, and had what seamen term a stiff breeze during the whole of the day. From 10 o’clock A.M. to past 12 P.M. we were under close-reefed mainsail. Some of the steerage passengers were very much frightened, asking the doctor if he thought we were to be ship-wrecked. Sabbath was a beautiful day, and I made the remark that the Bay of Biscay had a much worse character than it seemed to deserve, little thinking that Monday would give me cause to alter my opinion. It then blew something beyond a stiff breeze—I suppose a gale. Early in the morning the man at the helm was pitched right over the wheel that governs the rudder into the lee-scuppers, but luckily escaped without being much hurt. The helm was then lashed-to, all sails braced up, the main royal yard taken down, and our good ship allowed to drift as winds and waves might prevail. By degrees the wind fell, and the sea got up, and the rocking from side to side we then felt was anything but agreeable. If Monday was bad, Tuesday was not much better, and in the midst of the storm we had to put a young child overboard who had died the previous evening. To-day, Wednesday, it blows fresh, but we are beyond the Bay of Biscay, and feel relieved. I shall not attempt to describe the appearance of the waves in the Bay of Biscay in a gale of wind, as all description would come short of the reality. Suffice it to say, that those who encounter a gale there, where the supposed depth is two miles, may consider themselves pretty well seasoned, to say the least of it, for meeting gales on their way to Sydney or Melbourne. The only disagreeable feeling I experienced was a giddiness and confusion of the brain, which I could not then at all control. Wednesday 29 September — Again riding out a gale in all its glory, without a rag of canvas flying, and the helm lashed hard a-starboard. To say that the sea, is running mountains high would give no adequate idea of the scene around. Could I compare it to anything, it would be to thousands of mountains, hills, and vales, continually shifting their position in rapid succession, crossing and recrossing, as people do in a country-dance, while the spray, as far as the eye can reach, is flying as thick as you ever saw snow-drift do in a Highland storm in the month of December. It is altogether a scene more sublimely grand than I had any previous idea of — and I am beginning to enjoy it very much. Monday 4 October — Becalmed, from thirty to forty miles off Madeira. We have a fine view of the islands of Porto Santo, from which we are distant about five miles. They are about two thousand feet above the level of the sea, and appear barren, rocky, and, to us, rising almost perpendicular from the ocean, which is calm and unruffled, and in colour “deeply, darkly, beautifully blue,” as the finest indigo. Madeira we can only see indistinctly, being on the north-east side of it. Bonetta fish swimming all round the ship in pursuit of immense shoals of silver-coloured little fish, something like the herring fry. The bonetta appears, as seen under water, like an immense cod; but I am told is more in shape and colour like the mackerel. Four large ships within sight, becalmed like ourselves. We are just now passing the Cape de Verd Islands, where we expected to have put in and got some fruit for which we are all longing as much as ever Mother Eve did for the forbidden apple, but the wind is serving us so well that we must leave our expected Eden behind without even the pleasure of seeing it, except the towering peak of Saint Antonio, which seems to be only a younger brother of the Peak of Teneriffe. Monday 11 October — Shoals of flying-fish darting from the deep, and skimming along the waves like a flock of birds, then dipping, diving, and disappearing, like a dream of youth. Though parti-coloured, they appear white, and, to those who see them for the first time glancing in the sun, present a most beautiful and interesting sight — a sight which even the most unimaginative might be excused for associating with visions of peace, joy, gladness, and such pure unalloyed, and exquisite happiness as poor, plodding, ever-anxious and degenerate man can never hope to attain to in his present state. How little is known, even by the most learned, of the works of creation and yet how many and various are the objects which pass beneath the eye of the most unlettered, to excite his admiration, and to raise his mind to the Creator of all! To me, a flying-fish, a creature in size less than a common herring, has just been the source of as pure and unmixed pleasure as I have tasted for a long time. Tuesday 12 October — This morning we had the melancholy task of consigning two more children to the wide waste of waters; and it was truly distressing to witness the heart-breaking and unspeakable anguish of the mothers, as their dear babes were engulfed by the devouring deep. Pregnant women and young children have little idea of what they have to suffer when they enter on such a voyage as we are now on. The food, however excellent of its kind, is not such as they have been accustomed to; the water soon be-comes foetid, inducing flux and diarrhoea; the crowded state of the deck, with the rolling and pitching of the vessel, preclude anything like healthful exercise during the day; while the heat, and the number of people in the sleeping apartments, are equally inimical to refreshing repose during the night. To all these discomforts must be superadded the monotony of the voyage, which of itself is apt to cause fretfulness, debility, and low spirits, which, if not struggled against and overcome, may in time eventually prove fatal. We have children of all ages on board, from the child of three months old and upwards. The doctor is particularly humane, attentive, and obliging, and has a great deal to do. The captain is equally assiduous in his endeavours to promote the comfort and happiness of all under his charge. We have also music, dancing, and singing every other evening, but yet for all this we have individuals among us whose physical powers give way, and whose minds refuse to be comforted. Wednesday 13 October — Another young child has gone the way of all flesh this morning. All those who have died, with one exception, have had the measles, of which we have had several cases on board; they came out very well, but the bad water brought on flux, which soon reduced them to skeletons, and made them to death an easy prey. Thursday 14 October — This morning, between seven and eight o’clock, we were caught in a sudden squall of wind and rain, in the tenth degree of north latitude, and our fore, main, and mizen-top masts carried clean away at one fell swoop. The squall had just passed over us, and we were congratulating ourselves on our escape, when the ship, in recovering herself, gave a lurch from the top of a wave into the trough of the sea, and, with the jerk or rebound backwards, masts, canvas, and rigging went to the lee-side with a crash, and there hung suspended above the water, while the poor “Anne Milne” limped along like a lame dog, shorn of her fair proportions. All hands were instantly called to clear away the wreck; and now the deck, from end to end, is strewed with spars, canvas, and ropes. As the saying is, “There is nothing so bad but it might have been worse,” and we were fortunate in being dismasted in daylight, instead of in the night; fortunate in there being no men aloft at the time, else they must have been killed or drowned; and fortunate in not having been thrown on our beam-ends, as in that case the masts must have been cut away by the boards, and even then it is doubtful if the ship could have righted herself, as she is what they call very crank, that is to say, she would require about a hundred more tons of ballast to make her stand up to her canvas in a side wind. The carpenters, assisted by some emigrants who can handle the axe and the plane, are busy preparing masts and yards, and in a few days we hope to be all right again. I went up to the cross-trees of the mizenmast in the afternoon to view the wreck, but made no stay, as it was by no means a pleasant sight to look upon. Tropical squalls are very sudden and destructive in their nature. The sky along the coast of Africa just now is red and lurid, and glowing like an immense sheet of copper. Friday 15 October — Last night has been very squally, with immense torrents of rain; just now it is pouring down most gloriously, so much so, that some of the emigrants declare that the heaviest Scotch rain is but mere mist to this, while others think every drop sufficiently large to quench the thirst of a whale. Sharks and albacores are tumbling about the ship; the albacore, as seen under water, is an ugly monster, like an overgrown cod. Tuesday and Friday are the emigrants’ washing days, when the ship is splendidly decorated with something like a new addition of Captain Marryat’s signals. To-day men and women are washing away with all their might, quite delighted ducks. Cheery men, 0 ye ho! then raising their voices higher and higher as they proceed, and dwelling long upon the ‘0’ and the ‘ho,’ which has a very fine effect. One man generally sings, not perhaps a song, but anything which may come into his head, such as “Pull away, men, for a glass of rum” or “Up with the sail, for a pint of good brandy,’ — in fact, anything of a lively tendency; then all burst at once with heart and soul into the chorus, while the perspiration streams from their brows like rain. Yesterday, however, they took us rather by surprise, when the full strength of the company burst all at once upon us with “Rob Roy Macgregor 0,” the “Jolly Beggars,” and several other songs, all exceedingly well sung. It was something so different from the sacred music, psalm-singing, and quiet demeanour of the Sabbath-day, to which we had been accustomed in dear old Scotland, that it was some time before we could make up our minds to our true position, and bring them to bear upon the various changes one short month had made. Scarcely had the merry song died in our ears when we were called upon to listen to the wailings of a bereaved mother for the loss of an only child. We were becalmed at the time and as the corpse was dropt from the stern, and had a considerable distance to fall, the splash which it made upon the water had a most chilling and disagreeable effect upon the feelings. Truly the sounds of mirth and the sounds of mourning never mingled more jarringly on land than they do here. Small as is an emigrant ship compared with a town or city, and humble as the little world therein may be in comparison with the great world without, yet in that ship an attentive observer will find much matter for remark, and the moralist be at no loss for a subject to employ his pen. The thing is of easy explanation: human nature is the same everywhere; and if the passions show themselves less in small communities than in large ones, it is not that they are less active within the breast, nor, I am afraid, less resolved to make up for temporary suppression when again they have an opportunity of coming in contact with the hot throng — the great world of man. We were accompanied by several sharks yesterday; they went round and round the ship with as much circumspection and regularity as “the sentry walks his lonely round,” and they were preceded by the pilot-fish—a beautiful creature with brown rings round its body, which is known to forage for the shark, as the jackal is said to do for the lion. Two more young children have just expired. God pity and support the poor mothers, for here the parental feelings are much and severely tried! To lose a beloved child on land is, no doubt, a severe affliction; but to see one breathe its last at sea, with the knowledge that in a few hours thereafter it must be food for the sharks, is indeed distressing, and more than poor human nature can well endure. They were much wasted, but the expression of the face was tranquil, mild, and innocent. The youngest one, four months old, opened its eyes and smiled sweetly in its mother’s face, although its lips and mouth were black with disease. Without being much versed in the physiology of man, it occurs to me that the lungs of most children under five years of age — even had they nothing else to contend with — must be too weak to respire freely in such a suffocating atmosphere as they have to encounter on their way from Great Britain to Australia. There are a good many children here under that age, who it is to be hoped will reach the place of their destination in health and safety, though not, I am afraid, with the same rosy cheek, plump arm, and joyous smile they once exhibited in the humble homes of their native land. Since making the above remarks, I have had some conversation with our surgeon on the subject to which they refer. He gives it as his opinion that children from one to two years of age run the greatest risk; that children at the breast, should their mothers be healthy, and stand out the voyage, run less risk than those a year or two older, and that children of three years of age have as good a chance of escaping the casualties of the voyage as those of more advanced years. In corroboration of this opinion, all who have died as yet have been under two years of age. Mr McLaren also informs me that all those without exception who have lost children, though much afflicted for their loss, by no means regret having undertaken the voyage; they were perfectly aware, before leaving, that their children would be exposed to much danger, but all very naturally thought, though those of others might die, that their own might escape. Mr McLaren is an able and experienced practitioner, very humane, attentive, and obliging, much and justly respected by all on board, and one on whose opinion as a medical man every reliance may be placed. Wednesday 20 October — Another child dead. Thursday 21 October — Another child dead. Such a breaking up of the dearest endearments, such a blasting of the fondest hopes, and tearing asunder of the tenderest ties as I have seen in the course of five short weeks, is enough to make the heart callous and insensible to all suffering; and yet every fresh bereavement affects me more than I can well express. For this reason I have begun to avoid, at least for a time, seeing any more children put overboard. We have been becalmed for six days in the variables, but have lost little or nothing by the delay, as it required all that time to make the “Anne Milne” assume something like her former beautiful appearance. Here we have neither Scottish gleaming nor English twilight. No sooner has the sun disappeared in a flood of tropical glory, than we are left to the mild and gentle light of the moon and stars, and they certainly do look out upon us most delightfully. So free and unimpeded is the communication between the heavenly bodies and the great world of waters below, that I have seen the starry rays forming luminous tracks along the ocean, even in moonlight, nearly as bright as a lunar rainbow. One night lately, I had a melancholy pleasure in sitting on the stern of the vessel, and watching what I took to be the northern Pole-star disappearing below the horizon. In this way I looked upon it as some friendly eye beaming upon me to the last from my native land. The idea was fanciful, but nonetheless pleasing on that account. Unless in rainy or somewhat thick and hazy weather, I have rarely observed the clouds ascend here as they do in colder regions. During the day the sun has all heaven to himself; towards evening the clouds generally gather themselves in large and irregular masses of no great elevation, and form around the horizon a most magnificent drapery, on which the enraptured eye could dilate for ever. To describe them accurately — for any attempt at embellishment would only be but burlesque here — would require language even beautiful as themselves, and more space than I can spare, were I competent to the task. Suffice it to say, that images or representations of all or nearly all that the most curious eye could trace in any department of nature, or the most fertile in fancy form in his own imagination, may be found there. The eye cannot wander from one object to another without finding something new, either in shape, shade, or colour, to arrest the attention and excite remark. But no sooner do we turn our face towards the descending sun than we are spell-bound to the spot, and the mind completely, literally overpowered, bewildered, and lost, and every faculty and feeling quite absorbed in silent, mute, breathless, and deep soul-felt admiration. No language, however beautiful, no description however glowing, could possibly convey any, even the most distant idea, of the truly grand, rich, diversified, ever-changing, and gorgeous splendour of the scene. How cold the heart, how insensible, how inanimate the eye that could look, and yet look with a mind unmoved, upon such a glorious display of the works of the Almighty! What contemptible daubery is even the most elaborate, the most highly-prized, and applauded masterpiece of ancient or modern art, when compared with one single inimitable touch of the pencil of Nature, as seen in those tropical skies! And if the mere exhalations of this earth — a speck in creation — be so transcendently beautiful to the eye of sense as to impart the most exquisite, the most ineffable delight to the soul, what must the heaven of heavens contain, and what must be the happiness awaiting those who may yet be found worthy, through the merits of His Son, to see their God face to face, and to look with a strong untiring eye upon all His fully to enjoy and comprehend them? Mountains piled upon mountains, or, I should rather say, vast amphitheatres of mountains, hills, and plains, rocks, ruins, pinnacles, pyramids, woods, waterfalls, and volcanoes, are seen, part shaded in mist or denser matter, part standing out in bold relief, through whose cave-mouthed archway, castellated turrets, ravine-like, lake-looking, and thousand other fantastic openings, the azure, amber, orange, purple, vermillion, and golden sky is beheld peeping, glimmering, glancing, gleaming, and glowing forth; while wave after wave of the most beautiful, delicate, and ever-changing colours keep constantly ascending the clear and cloudless firmament, there mingling their brilliant hues, and casting their shadows on the glancing ocean below, till the last rosy rays of the setting sun retire, when the whole become merged in one uniform leaden grey. I was little aware till I beheld those wonderful skies, of the extreme weakness of the English language, or rather of my own utter inability of applying it properly; but I feel quite convinced that even those who possess the greatest mastery over it would find themselves perfectly at a loss for words sufficiently strong to give adequate expression to their feelings of admiration when attempting to describe the unrivalled glories of an evening scene within the tropics; and feeling thus, I shall not say another word on the subject, since anything I could say would be quite unsatisfactory to myself, whatever it might be to others. Friday 22 October — We have had a birth on board this morning. The young mother is quite delighted with her first-born, a fine boy. Saturday 23 October — A shark was caught to-day, he must have been very hungry, for after being hooked and above water, he disengaged himself, fastened again, and was hauled on deck, after many noble struggles to keep below. He measured seven feet in length, and was thick in proportion. Three fish, called suckers, the largest about eighteen inches in length, were sticking to his side. They were put into a tub of water, and stuck to its side as they had been doing to the shark. Trying to disengage the largest that we might examine it more minutely, it sprung from the tub on deck, which happened to be wet, and there adhered with such force that a powerful young man was unable to pull it off, till he thought of giving it a sudden jerk to one side, when it slipped from his fingers and had almost fastened on the foot of a child. They adhere by the back of the head, which is flat, and formed something like the leaf of a tree, with a line along the centre, and diagonal lines branching off from either side. They are ugly, dark-looking monsters, and resemble the shark a good deal in formation. Friday 29 October — Another child, a boy from three to four years of age, died last night, being the oldest we have yet lost out of eleven who are now dead. I have watched the progress of decay in several, and found it the same in all: no pain, no fretfulness, no apparent uneasiness, a gradual prostration of strength goes on from the commencement of the disease. The face assumes a languid sickly appearance; the legs and arms become more and more shrunk and attenuated; the eye remains longer and longer closed, the lips more and more apart; till the mouth becomes gradually black, and then the lamp of life goes out, without even a momentary flicker. One very stout boy, and only one, two and a-half years old, bore up wonderfully to the last: even when the film of death bedimmed his eyes he put up his hand and endeavoured to wipe it off, that he might see his parents; but, alas! it was immovable. Of all strange animals, man is surely the most strange; notwithstanding the number of deaths we have had, and may yet have, the song, the laugh, and the homely jest continue to be heard as lively, as loud, and as pointed as if every heart beat happily, and all went merry as a marriage-bell on board. Monday 1 November — Mr Ramsay, from Edinburgh, who was recommended to my good offices by his friend, Mr Tullis, bookseller, Cupar-Fife, before leaving the Tay, died on Saturday 30 October, at half-past nine o’clock evening. As we both slept in the same cabin, the largest and best ventilated in the ship, I am happy to think that I was thus in some degree enabled to fulfil my promise to Mr Tullis, by rendering to his deceased friend some little services which others, however willing, had it not in their power to perform, particularly during the night. Mr Ramsay was in a very delicate state of health when he came on board, and grew weaker and weaker every day as we proceeded on our voyage. For the last three weeks he never left his cabin, nor, for the last three or four days, his bed, except in one instance, and that one a little before two o’clock on the day on which he died. From two o’clock till he expired, Dr McLaren and I never left his bedside, with the exception of a few moments. Captain Thorns was also present when his official duties did not interfere. He suffered a good deal for some hours before he died from a burning heat in the stomach, and cried out, “Oh, this is intolerable, doctor; do you think it is worth my while to contend with this?” These were the only complaints I ever heard him utter. We kept sponging his brow with vinegar, and his stomach with warm water from which he seemed to derive considerable relief. Dr McLaren was unremitting in his attention to him, and Mr Ramsay had the utmost confidence in his medical skill, and often spoke in the highest terms of his mild and obliging manners and disposition. However much his friends may be afflicted for his loss, it must be gratifying for them to learn, that everything was done for him that could possibly be done under the circumstances in which he was placed. He had his appetite to the last, and enjoyed his meals up to the day on which he expired. His cheerful manners and kindly disposition endeared him to all his fellow-passengers, by whom he was much regretted. The night previous to his death, as I was going to bed about ten o’clock, he said to me in a cheerful, clear, distinct tone of voice, “I have just had some beautiful dreams” “Indeed, Mr Ramsay,” I replied. “Yes,” said he, “I cannot tell you what beautiful dreams I have just had, but the conclusion was that I stretched myself out and off I went” There was something so peculiar about his manner, half-jocular, half-earnest, that I was a good deal startled, and lay awake the most of the night, afraid that he would be dead before morning. There is something awfully solemn and deeply affecting in seeing a fellow-creature die. I tried to discover if the departing spirit had any glimmering of a future state, but found that this is a discovery which everyone must make for himself. Tuesday 2 November — Another child died this morning. We crossed the Line to-day, and might have done so a fortnight ago had it not been owing to calms and contrary winds. The mummery usual on crossing the Line took place some days ago, on a small scale, in anticipation of reaching it sooner. Instead of being stewed, broiled, and roasted, as we ought to have been on crossing the Line, we all felt quite cool and comfortable, and not at all given to the melting mood. Wednesday 3 November — Neptune, not satisfied with the scanty honours paid him some days since, presided this forenoon in great state, trident in hand, supported by Mrs Neptune, and attended by his constables, coachman, doctor, and barber, and had the happiness of seeing ten or twelve seamen, a great number of steerage and some cabin passengers, receive in all due form those initiatory rites which entitle them to pass and repass as free denizens of watery domain. The whole was grotesque and laughable enough, but has been so often and so well described, that I shall not enter into it. One thing, however, I observed which I may mention, more particularly as no one has alluded to it, so far as I recollect, namely, that it gives those who have to obey an opportunity of hitting pretty hard at those who command. The barber, a stout jolly seaman, before applying the razor to the chin of his brother tars, lectured them well upon their various duties as men before the mast, and then told them, should they ever become officers, and have the command of others, not to treat them like dogs, and damn their eyes to do this and to do that, but to treat them civilly, and to give their orders in a becoming manner, and they would find the more prompt and willing service. This I took to be levelled at one of the officers, who is not particularly well beloved by those under him. This evening we had the most brilliant display of phosphorus I ever saw, or could wish to see. It came blazing along each side of the ship from the bows, reuniting at the stern, and then swept along behind, gleaming, bursting, and flashing like mimic lightning. It was not confined to the ship’s track, but was seen a great way off on either side on the top of every breaking wave. The globules of pale blue light were from the size of a watch glass to that of a large breakfast saucer or dessert plate. On looking out at the stern windows many of the globules appeared several feet below the water, at the ship’s side they kept the sur-face. Thursday 4 November — Another child dead. Friday 5 November — The child over whose birth we all rejoiced on the 22 October, died this morning. Monday 15 November — This morning, between six and seven o’clock, when going at the rate of ten knots an hour, the wind shifted round instantaneously and took us quite aback, and for a few minutes we were placed in the most dangerous situation that a ship could be in; luckily, except losing our fore, main, and mizzen sails, and the mizzen boom, nothing of a serious nature happened. Wednesday 17 November — Twins, a boy and a girl, were born to-day, but being in the seventh month, lived only a few hours. The ‘mother is doing well. The weather is delightfully cool; there is little or no sick-ness on board, and all are cheerful and happy. Monday 22 November — Yesterday we had an addition to our number, a boy, born in the seventh month. Tuesday 23 November — We were a good deal amused to-day with the unwieldy gambols of a number of whales of the finer species, among which the “Anne Milne” had set her nose rather unexpectedly; they went off spouting and blowing as fast as they could, making the water fly aloft like the vapours of a steam-engine, but not before one of the passengers sent a ball into the back of one of them; it seemed, however, to affect him as little as a pea fired from a pop-gun would a castle wall. A few days ago, when going at the rate of ten knots an hour, we had a race with an immense number of porpoises, which kept alongside of us for a great way, darting along frequently on their side, and seemed to enjoy the sport amazingly. They reminded one of a parcel of boys running alongside of the mail-coach on the Queen’s birthday. Another child, about eighteen months old, died to-day. Wednesday 24 November — To-day we spoke to “Samuel,” Babbington, of London, from Cork, with three hundred and five emigrants, and a good many cabin passengers, bound for Port-Philip. They left five days after us, and we both crossed the Line on the same day. Our emigrants and their Irish friends hailed each other with three cheers, and had a good deal of laughing and joking together while within speaking distance. We soon left “Samuel” behind, as we have hitherto done all others. Had we been fitted out as a whaler, we might have been swimming in oil by this time, as the whales are blowing and tumbling all around us. Tuesday 7 December — Had it not been for calms and contrary winds, we might have been past the Island of St Paul’s by this time, whereas we have yet scarcely doubled the Cape of Good Hope, being in 381/2° South and 18° 20′ East. About the middle of last week we began to experience a fine south-west breeze, which sent us along beautifully at the rate of eight-and-a-half knots an hour. On Sunday it increased during the day, the sea rising in proportion, and by ten at night it blew so strong and squally that we had to take down all our studding-sails, which till then had been flying. On Monday morning, the wind still increasing, more sail was taken in, and still we went along with accelerated speed. By this time the sea all around, as far as the eye could reach, was one wild scene of tumbling, tossing, breaking, and bursting magnificence, forming altogether one of the most sublime spectacles the eye could desire to look upon. Of all the seabirds, the albatross alone, from his great size and strength, was the only one able to cope with the storm; and to me there was something truly grand in seeing him soaring, with the greatest apparent ease and self-possession, like the spirit of faith in the region of fear. About one o’clock P.M., we were struck amid-ships by a pretty heavy sea, which knocked in two of our stern windows, one in my cabin, and another in the opposite one, occupied as a store-room, by which we were completely deluged with water. As it was we were a good deal startled; but had it happened in the night-time, we would have been much more seriously alarmed. To-day the sea is still high, but the wind more moderate, and we are rattling along under more sail at the rate of ten knots an hour. Last night we lost a fine, and rather respectable, young woman, of the name of Robertson, belonging to Ireland. She had been ailing about a month, and has a brother and sister on board. During the rolling and pitching of the vessel yesterday, Mr Anderson, from Arbroath, was thrown from the quarter-deck against the bulwark, and cut his nose very severely, so much so that it is to be feared that it will disfigure his face. The weather-glass is falling rapidly, the gale approaching, and the order given for all hands to close-reef top-sails, so that we may look out for a rough ride. Wednesday 8 December — Bad as we thought the Bay of Biscay, it was comparatively plain-sailing to the seas we encountered on doubling the Cape of Good Hope, and yet those of our number who have been to North America say that they are nothing to what they have seen on crossing the Atlantic. From this I conclude that some people are either sadly given to amplification, or get so much accustomed to sea scenes, that they would think nothing of anything that could happen them, with the exception, perhaps, of the trifling concern of being drowned; and yet I observed one of those individuals who had crossed the Atlantic look rather pale when our stern windows were struck by a heavy sea and knocked in. Monday 13 December — Being becalmed, the captain and some of the passengers went out with the boat on a shooting excursion, and killed five albatrosses and several other birds. The shooting party had no sooner returned than a fishing party was formed, who had good sport. Two blue sharks were discovered swimming round the vessel, the smallest of which was caught, measuring eight and a half feet in length, and of proportionate thickness. On cutting it up forty-two young sharks made their appearance, and caused a good deal of screaming, skirling, and laughing among the women as they spluttered about among their feet, “all alive and kicking.” They measured fully nineteen inches in length, and, like the mother, were pure white on the belly, and a beautiful blue on the back and sides. I have got one of them preserved in spirits, also part of the back bone of the mother. Thursday 16 December — Since Monday evening we have been mostly under close-reefed mainsail, with a very heavy sea, which made the “Anne Milne” go like a swing at a show, quiver and shake from stem to stern like an aspen leaf, and creak again like an old cradle. Had we been deep in the water, our bulwarks must have been swept away; as it was, they were often lipping with the water, but always made the mountainous waves retire with a growl, after sending their flashing, frothy tops along our quarter-deck. Apparent danger at sea is something like anticipated misfortune on land, worse in prospect than in reality, more in the mind than in the matter, and when we come to grapple with either we soon become ashamed of our fears, finding that imagination was the’ cause of our cowardice. We are all now such excellent sailors that nothing short of shipwreck or drowning would give us much alarm. A fine, interesting girl, six years of age died this morning. She had the hooping-cough for a month past. Just as we sat down to tea, at six o’clock this evening, an alarm was given of a man overboard. We all rushed on deck, and learned that it was one of the seamen, a young man belonging to Shetland. The ship was immediately put about, a boat lowered down and search made, but all in vain: no trace of him could be found. It seems he had gone outside the forecastle on some private affair of his own, and stopping longer than usual, someone looked over and found him gone. By the time the alarm was given it is supposed that he had been ten minutes in the water; and as it required about five minutes to put about the ship and lower the boat, he must then have been fully two miles astern, as we were going at the time from eight to nine knots an hour. Poor man, his end was sudden, unexpected, and melancholy, and must be a sore affliction to his parents and friends. His sad fate has cast a temporary gloom over all on board and is another striking instance, among the many we have had, of the uncertainty of human life. Here, if anywhere, we may be said to walk upon the brink of the grave, and look into the gulf that consigns to eternity. But, alas for poor human nature, it is the same on sea as on land, a voice from the living can appeal to our worldly passions, and win regard, but a voice from the dead can only appeal to our soul and our reason, and to that we are too apt to turn a deaf ear. Friday 24 December — To-day, we have had an addition to our number in the birth of a boy. Both mother and child are doing, and likely to do, well. Monday 27 December — Last night a fine young lad, of fourteen or fifteen years of age, died, after two and a-half months’ illness. His father, who is a decent but delicate-looking man of the name of Duncan, from near Brechin, will feel his loss very much, as he was his eldest son, and would naturally have a good deal of dependence upon him. Friday 31 December — Another addition to our number, in the birth of a girl, the mother’s twelfth child, and with which the old man, the father, was as much delighted as if it had been his first-born. 6 January 1842 — The steerage passengers brought in the New Year with a glass of rum, and nine hearty cheers: and most of those in the cabin with a glass of wine and much conviviality. We passed the first day of the new year very agreeably, and in our after-dinner potations our absent friends were not forgotten. During the last five days we have been under close-reefed mainsail, with very heavy gales from the north-west. The weather was very cold, and on Sunday we had thunder and heavy showers of hail. Yesterday we had another birth on board — a boy. We expect to see Van Diemen’s Land to-morrow.